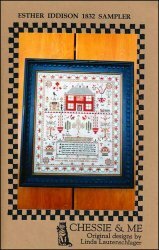 Esther Iddison 1832 Sampler [W6149] - $24.00 : Yarn Tree, Your wholesale source for cross stitch supplies. Cross stitch pattern from Chessie & Me. A big red house stands at the top of this design. Potted plants, birds, people, etc. are stitched around and below the home. A saying is stitched towards the bottom of this design. A border is stitched around this design to complete it. Stitch count 280h x 239w.